It’s big. Actually, it’s massive. Good things may indeed come in small packages, but as tonight’s five star audience including President Hollande and various music industry magnates sit down in Paris’s new 2400 seater Philharmonie concert hall for the official opening concert, everyone should be awed by this humungous and daring piece of spatial construction by architect Jean Nouvel. And that’s before even the first note sounds. Sitting inside the hall is like being cocooned in a gigantic egg like space, with hanging sections of audience seating protruding from the walls and coming at you in all directions, and softly elongated curvy acoustic baffles stationed above like majestic sets of passing clouds. In design terms it’s as if the French Republic had declared an end to the rule of the Cartesian straight line in favour of asymmetric natural curved forms, with a structural and acoustic design derived from – but significantly extending – Berlin’s namesake Philharmonie, the ‘granddaddy’ of all great post second world war concert halls. It’s definitely a vote (to paraphrase Billy Bragg on the Festival Hall in London) for the future. I know a little about this hall only because I had the luck to attend the previous night’s general rehearsal (for which read general concert) with run through performances by Paavo Jarvi, Mathias Goerne, and the Orchestra de Paris and its choir, of Ravel’s Daphnis and Chloe Suite 2, 3 movements from the Faure Requiem and Stravinsky’s Rite of Spring, plus a little open rehearsal thrown in for good measure. The big, and I guess good, news, is that there is a fair amount of the two really fundamental requirements of the acoustic of any successful concert hall, viz. bloom and clarity of sound. It’s certainly not overly warm compared to the world’s three really iconic concert halls (Boston Symphony, Amsterdam Concertgebouw and Vienna Musikverein). Forget bathroom synonyms for example, but there is enough brightness here to be going on with, and with that relative, but not huge, level of bloom, comes a pay off of epic proportions in terms of some really interesting clarity, and for me that’s an incomparable gain. Yes, the likes of Vienna can make you swoon, but you know what? By now I quite like hearing the detail of what’s being played. And the new hall manages this clarity, crucially, without the hardness of otherwise great halls like Lucerne. Relatively bright it can be, but on last night’s showing, never hard. This then, despite its scale, is still a musician’s hall. And for orchestras who play here, you’d better hear it now: this is not going to be an easy hall to hide in despite its size, as was demonstrated time and again last night. When the likes of Berlin, Vienna, Amsterdam, Bavaria and Budapest alight here (not to mention an impending Bolivar Dudamel Mahler 5) every one of those great orchestras better be ready and prepared. I suspect that it is also going to depend a lot on where you sit. The highest level 5 seats were way too vertiginous for my elderly and knowing companion, and no one in their right mind would have wanted to sit behind the orchestra and watch the backs of the chorus singers in the level 4 seats that we were given. The word had been that the best sound would be – as it often can be – in the cheaper seats towards the top of a hall where you catch those 2nd and even 3rd reflections of sound off the walls and ceiling more quickly. But for last night a few of us opted in the first half of Ravel and Faure to get ourselves into some prime centre front stalls seats around row 10, and in the second half moved back to the rear stalls section just before the shallow overhang begins a couple of rows behind the front of this section. Even in these two places not that far from each other, the sound was significantly different, and as you get into some of those higher up overhangs I imagine that things will change yet again. Nearer the front there was a real feeling of engagement and warmth with the sound, but further back I felt that the sound rarely leapt into the hall towards me. This difference is not necessarily a bad thing, it just means it’s worth getting to know the hall and choosing wisely for artist and programme. Time and again though, details amazed me. Big final chords positively erupted into the hall with a reverberation that is still, the following day, an excitement to remember. Yet the pianissimo trumpets in the second half of the Rite of Spring played quieter than I can ever remember hearing a brass instrument at that distance, whilst being perfectly balanced and easy to hear, and the sound of the muted ‘cellos and violas that followed was only broken by an accidental bass bow hitting what seemed like a music stand. I swear I even heard the cor anglais player close his reed box towards the end of the Stravinsky. There are also ‘noises off’ from the audience and foyer areas in such a lively space, and so throughout the evening my ears were assaulted with sheeting coughs in quiet passages. First violins often sounded as if behind a veil, both when loud and also when on their own. And I was astounded at one point that their pizzicatos – with violins facing towards me – sounded less clear than the bowed violas that followed, despite the violas pointing away from me to the back of the hall. Care will need to be given to the height of the back riser (the lower the riser the more resonant the timps and percussion as their sound hits off the back wall), which worked well enough for the enthusiastic bass drum player who turned a section of the Rite into a festival for bass drum with orchestra. Mathias Goerne was the undoubted hero of the evening, and showed that this will be a great space for the best singers. His sound was continuously rich, creamy and imperious, and he looked as if he had oodles of voice to spare. The choir was by turns impressive and deeply troubling: Their Daphnis opening was as dreamy as you could ask, and yet they had the penetrating clarity required for the opening of the Faure – it was as if they had started in London’s Royal Albert Hall and decamped to a small dry cathedral – yet their intonation often found them as flat as a pancake, with the organ chords following them sounding embarrassingly sharp. One of the questions about this hall is its location, bang on the Paris Périphérique ring road and away from traditional cultural, political and physical heart of Paris. Without doubt that may cause a problem for the fur coat brigade, but with the need for classical music to get away from – not nearer to – cultural snobs and conservative fur coats, this is undoubtedly a move in the right direction. Think Demos and you can already see the deep intelligence of its locus. I wandered around at the interval. The foyer varies from the nicely designed lower floors to the ugly 80s night club low ceilings of the upper spaces. Backstage is the usual transition to lower orders design. 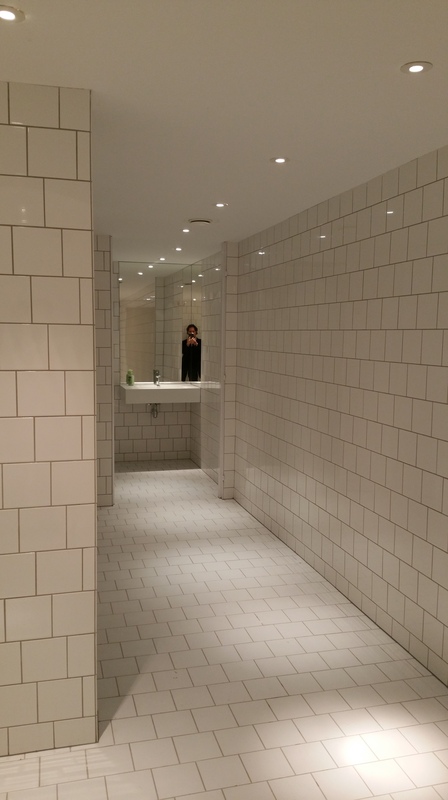 Mind you, nice toilets backstage (see picture below). What will work here? Actually quite a lot, because the clarity and balance allows both large and small scale. On a practical level, when it’s actually ready (months off from what I could see, I was really astounded by the lack of finish throughout), if they can stop the stalls seats from wobbling, if they can get rid of the excruciating background hum that I could hear in every silence, when it’s staffed by ushers who all know the answers to our questions, when the storm over the Salle Pleyel has died down – and it will – and when we have forgotten the gargantuan bill for its construction – and, again, we will – then this will be one of Europe’s best halls. And so in the end this is nothing but a cause for celebration, a bold enterprise in an age noted more for anxiety and doubt than confidence and self-assurance. The other two Alpha+ cities of London and New York will – for now – only be able to look on with envy. 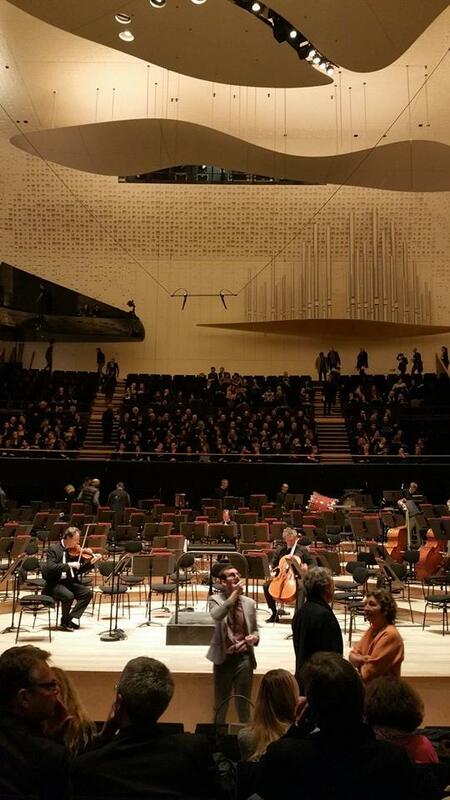 Of course New York has Carnegie, but if London ever needed an argument for having a great conductor and a great orchestra inhabit a great hall (and we all know who and what I am talking about), then the Philharmonie in Paris is indubitably it. Well done Paris, well done master acousticians Sir Harold Marshall, Marshall Day Acoustics and Yasuhisa Toyota, and well done Laurent Bayle, the quiet super human who in the end has made this success a financial and political possibility. This entry was posted in Uncategorized on 14 January 2015 by Marshall Marcus. C’est peut-être beau mais cela nous coûte très très cher alors que nous sommes plongés dans les déficits, alors qu’il existe déjà une salle toute récente et rénovée et qui sera INTERDITE à la musique classique au profit de spectacles “actuels”, pour FINANCER les coûts de fonctionnement exorbitants de ce petit bijou. Un vrai scandale !!! It’s clear that this monstrous “grande project” is far from the wonder hall it’s supposed to be but most scandalous is the fact that the Salle Pleyel was fully renovated only recently and is now acoustically probably better than this new bemoth – at a fraction of the cost of course! This is just typical of egocentric Government and designers to ignore the reality of France’s economic position and “carry on regardless” Personally I hope it’s a total failure. at least for classical music, which should return to it’s rightful home.